In November, St Matthias Primary School received £3000 from the Heritage Lottery Fund (HLF) First World War: then and now programme. 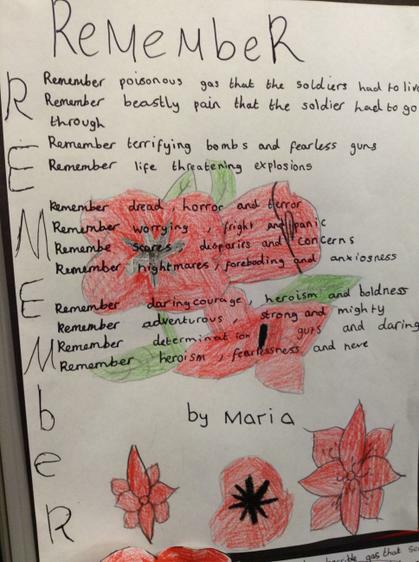 The project was awarded to the school to enable the pupils to explore and share the story of Malvern during the First World War and particularly the soldiers that attended St Matthias Primary School. 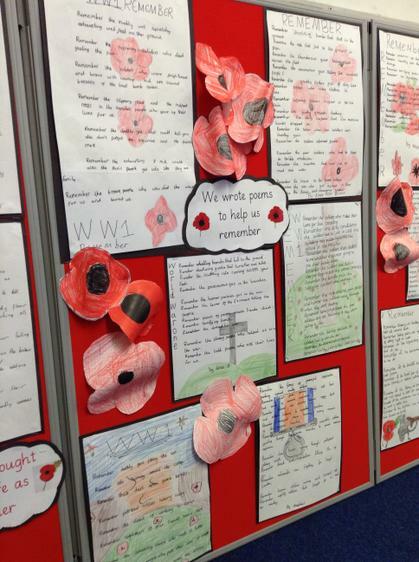 Since receiving the funding, children at St Matthias have held a variety of events to commemorate the First World War. Children from all ages have explored this historical event through Art, Poetry, Music, Sport and other curriculum subjects. The younger children within the school used the local area to learn about the soldiers from Malvern with a special visit to Malvern Library and the Memorial Statue. Parents and friends from within the community accompanied this trip and were able to use library resources to further their own investigations into past family members. 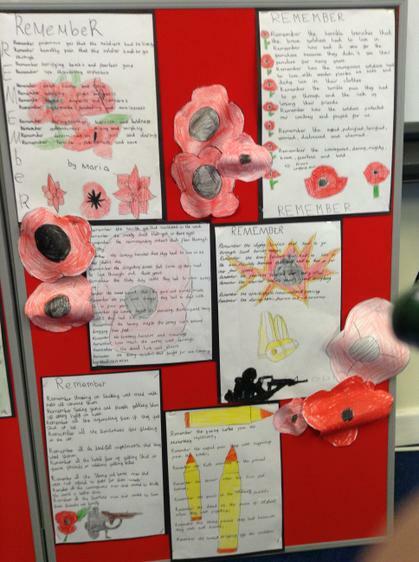 The older children have used the school memorial board as the inspiration to learn about the soldiers who went to St. Matthias CE Primary School. Using school records and websites they were able to find information about our local heroes who went to war and never returned. In December, St Matthias Primary School and Hanley Swan Primary School met for a special Year 5 and 6 football tournament to commemorate the World War One Christmas Day football match played between German and English soldiers on Christmas Day in 1914. In the next two months we will be continuing with this project by inviting local Historians and Artists to our school. The famous ‘History Man’ will use his wealth of resources to inspire children across the whole school. We have planned a poppy style Batik and there will be a poster campaign for the children to showcase their artistic skills. In marking the Centenary of the First World War, we hope the project will enable our school community to come together to preserve the memories and heritage of the people who lived through the First World War. The school will continue to collect photographs, newspaper clippings, documents, letters and photos of keepsakes, as well as family tales passed down to help them build a clear picture of what life was really like at that time. For further information, images and interviews, please contact Claire Davies at St Matthias CE Primary School. St Matthias has had an amazing opportunity: a history man came to teach us about World War One. We have learnt many facts we didn’t know about before; guns, grenades and clothes from Germany and England. We learnt how the soldiers defended themselves and fought. We also discovered which countries Germany tried to take over because they weren’t powerful enough to take over the British Empire on their own. We looked at posters. Strangely, the German posters made sense but the English posters did not make sense at all! The French tanks were bad during the war because they weren’t very protective; England, Germany and Russia had much better tanks. Both sides of war didn't use boats for warfare because they were too valuable for carrying supplies, weapons and their own possessions. At the end, we were fortunate enough to play with the weapons, clothes and look at the pictures. There were glasses which made normal pictures appear 3D! Cool! Listen to this poignant clip listing the names of every former scholar of St. Matthias CE Primary School who made the ultimate sacrifice in World War One. After the thoughtful and important assembly delivered by Year 2 we decided to find out more information about former St Matthias pupils who lost their lives in World War I. We started our research using the national medal archive website. Entering the names of the soldiers from the war memorial board allowed us to access facts about their role in the army. Additionally, we were able to find some information regarding their regiment. In search of further information we used the website Malvern Remembers. Malvern Remembers had biographies of each of the men listed on our memorial board. Reading about their lives made us further recognise the courage and bravery demonstrated by these soldiers during World War I.
George Haughton was one of the names listed on the memorial board. It was interesting listening to Mrs Davies speak about the emotional reaction of the niece of George Haughton when a school log book provided information about him. It inspired us to use the log books to help us with our own research. We looked through the original logbook and found his name and other soldiers listed. We owe so much to these brave men and are proud that they were students at St Matthias School. At the coming down of the sun and in the morning we will remember them. 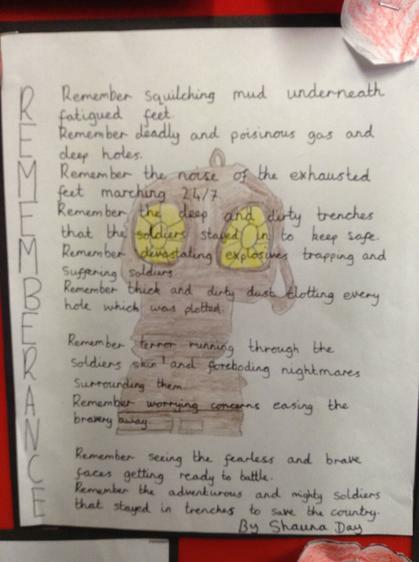 Year 6 wrote poems to help us think about what it was like to be a soldier in World War 1. We thought about the hardships and the courage the soldiers must have had to cope with the war. During the first Christmas of World War 1, something unique happened in some parts of the front line. Both sides on the western front agreed to put down their weapons. This became known as the Christmas truce. On Christmas Eve, soldiers from both sides met in no-mans land and sang Christmas carols like Silent Night. On Christmas Day a football match was played. 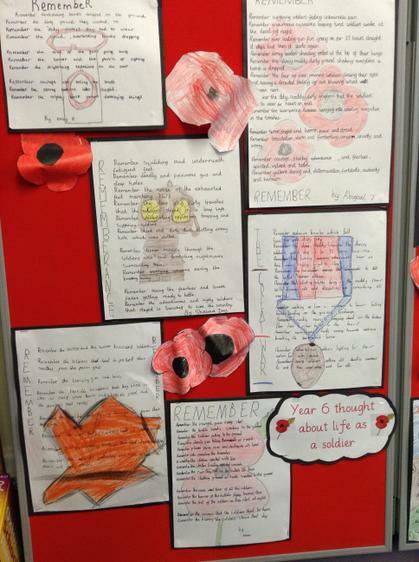 On Tuesday 2nd December 2014, the Year 5 and 6 classes from St Matthias Primary School went to Hanley Swan Primary School to commemorate this football match and to remember the soldiers who fought. Mr Pratley and Miss Wilkins welcomed us to their school with World War 1 songs, poppies in the fields and a football team warming up on the pitch. We played four matches. Year 5 girls, Year 5 boys, Year 6 girls and Year 6 boys each with teams of seven. We had St Matthias reporters on the side lines reporting each match using video and audio equipment. As the players came off the pitch they were interviewed about their performance and their reaction to the game. All of the football teams played very well and were a credit to the school. "There was a really lovely atmosphere on the field, the football was good and the children had a super time."